I AM Chakra Crystal Mists offer a uniquely transcendent aromatherapy experience designed to dramatically shift emotional and energetic states, and clear your external and internal environments. Lovingly crafted by master formulators using their extensive knowledge of plants and gem minerals in a highly intuitive process, each special blend is infused with tachyon zero point energy and attuned to the cosmic harmonious frequency of 432 Hz. Our mists positively affect brain chemistry and the emotional body as they strengthen and balance the chakras. As with our Chakra Flower Elixirs, we harvest our wild-crafted flowers by hand for our essences and choose the finest pure essential oils. Our gemstone essences are created during the full moon, and we finish each mist with highly transformative Mono-atomic Gold Ormus, known to revitalize the body and enhance clarity, creativity and insight. We alchemize each delicate blend in a base of spring water and bottle it by hand with loving care in the Cathedral Rock vortex in Sedona. Speak your truth wisely and from the heart with the support of this compassionate and purifying union of Blue Chamomile, Lapis Lazuli and other throat-activating essences. The soulful color blue suffuses our elegantly layered blend with its profound ability to enhance self-expression and inspire intelligent, authentic communication. 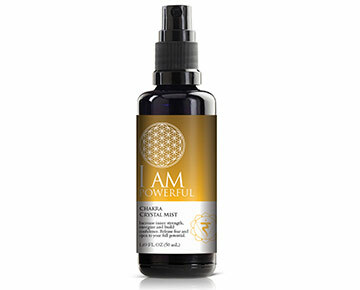 Step into the fullness and power of your whole being with this rich alchemical formula ruled by sacred Sandalwood. Imbued with the golden and yellow energies of citrine and topaz, exhilarating I AM Powerful opens the door to prosperity, success and abundance. The intense, earthen essences of Tea Tree and Ginger oils support Sandalwood to build confidence and strengthen the spirit, as mystical Jatamansi and fragrant Naroli relax and ground you. Access inner guidance and enter deeper states of awareness with the mystical energies of Frankincense, Palo Santo and Sweet Myrrh. Purify and release barriers to spirit as you calm and center the mind. Open to a profound awakening of spiritual awareness with this extremely rare distillation of three pure lotus oils from an ancient Egyptian lineage. We enhance the lotus triad with a complementary blend of essential oils and gem essences known for their mind and spirit-expanding qualities. Embrace higher levels of unconditional love for yourself and others as expanded feelings of kindness, gentleness and compassion envelope you. Feel your heart heal and open as this heavenly blend of essential oils and gems, inspired by Aphrodite’s sacred mysteries, re-energizes and balances your Heart Chakra. Ease effortlessly into the flow of life and feel stress and worry melt away, as the soothing scents of Lavender, Ylang Ylang and Chamomile calm your spirit. Almost instantly, you step into a fresh perspective, feeling relaxed, confident, centered and supported by the universe.